The following explains the differences of high- and low-level networking in Godot as well as some fundamentals. If you want to jump in head-first and add networking to your first nodes, skip to Initializing the network below. But make sure to read the rest later on! Godot always supported standard low-level networking via UDP, TCP and some higher level protocols such as SSL and HTTP. These protocols are flexible and can be used for almost anything. However, using them to synchronize game state manually can be a large amount of work. Sometimes that work can’t be avoided or is worth it, for example when working with a custom server implementation on the backend. But in most cases, it’s worthwhile to consider Godot’s high-level networking API, which sacrifices some of the fine-grained control of low-level networking for greater ease of use. TCP ensures packets will always arrive reliably and in order, but latency is generally higher due to error correction. It’s also quite a complex protocol because it understands what a “connection” is, and optimizes for goals that often don’t suit applications like multiplayer games. Packets are buffered to be sent in larger batches, trading less per-packet overhead for higher latency. This can be useful for things like HTTP, but generally not for games. Some of this can be configured and disabled (e.g. by disabling “Nagle’s algorithm” for the TCP connection). UDP is a simpler protocol, which only sends packets (and has no concept of a “connection”). No error correction makes it pretty quick (low latency), but packets may be lost along the way or received in the wrong order. Added to that, the MTU (maximum packet size) for UDP is generally low (only a few hundred bytes), so transmitting larger packets means splitting them, reorganizing them and retrying if a part fails. In general, TCP can be thought of as reliable, ordered, and slow; UDP as unreliable, unordered and fast. Because of the large difference in performance, it often makes sense to re-build the parts of TCP wanted for games (optional reliability and packet order), while avoiding the unwanted parts (congestion/traffic control features, Nagle’s algorithm, etc). Due to this, most game engines come with such an implementation, and Godot is no exception. In summary, you can use the low-level networking API for maximum control and implement everything on top of bare network protocols or use the high-level API based on SceneTree that does most of the heavy lifting behind the scenes in a generally optimized way. Most of Godot’s supported platforms offer all or most of the mentioned high- and low-level networking features. As networking is always largely hardware and operating system dependent, however, some features may change or not be available on some target platforms. Most notably, the HTML5 platform currently only offers WebSocket support and lacks some of the higher level features as well as raw access to low-level protocols like TCP and UDP. Gaffer On Games has a lot of useful articles about networking in Games (here), including the comprehensive introduction to networking models in games. Adding networking to your game comes with some responsibility. It can make your application vulnerable if done wrong and may lead to cheats or exploits. It may even allow an attacker to compromise the machines your application runs on and use your servers to send spam, attack others or steal your users data if they play your game. This is always the case when networking is involved and has nothing to do with Godot. You can of course experiment, but when you release a networked application, always take care of any possible security concerns. Before going into how we would like to synchronize a game across the network, it can be helpful to understand how the base network API for synchronization works. This object extends from PacketPeer, so it inherits all the useful methods for serializing, sending and receiving data. On top of that, it adds methods to set a peer, transfer mode, etc. It also includes signals that will let you know when peers connect or disconnect. This class interface can abstract most types of network layers, topologies and libraries. By default, Godot provides an implementation based on ENet (NetworkedMultiplayerEnet), but this could be used to implement mobile APIs (for adhoc WiFi, Bluetooth) or custom device/console-specific networking APIs. For most common cases, using this object directly is discouraged, as Godot provides even higher level networking facilities. Yet it is made available in case a game has specific needs for a lower level API. 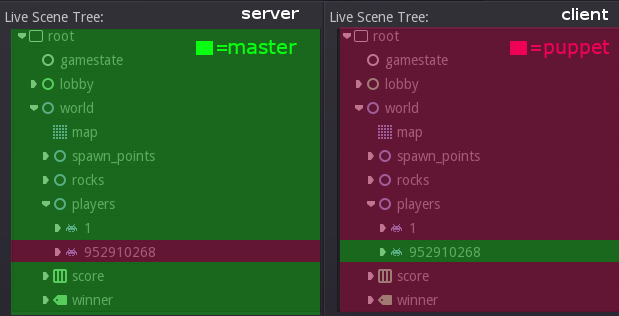 The object that controls networking in Godot is the same one that controls everything tree-related: SceneTree. To initialize high level networking, the SceneTree must be provided a NetworkedMultiplayerPeer object. To create that object, it first has to be initialized as a server or client. The above signals are called on every peer connected to the server (including on the server) when a new peer connects or disconnects. Clients will connect with a unique ID greater than 1, while network peer ID 1 is always the server. Anything below 1 should be handled as invalid. You can retrieve the ID for the local system via SceneTree.get_network_unique_id(). These IDs will be useful mostly for lobby management and should generally be stored, as they identify connected peers and thus players. You can also use IDs to send messages only to certain peers. Again, all these functions are mainly useful for lobby management or for adding/removing players on the fly. For these tasks, the server clearly has to work as a server and you have to perform tasks manually such as sending a newly connected player information about other already connected players (e.g. their names, stats, etc). Lobbies can be implemented any way you want, but the most common way is to use a node with the same name across scenes in all peers. Generally, an autoloaded node/singleton is a great fit for this, to always have access to, e.g. “/root/lobby”. Reliable: the function call will arrive no matter what, but may take longer because it will be re-transmitted in case of failure. Unreliable: if the function call does not arrive, it will not be re-transmitted; but if it arrives, it will do it quickly. In most cases, reliable is desired. Unreliable is mostly useful when synchronizing object positions (sync must happen constantly, and if a packet is lost, it’s not that bad because a new one will eventually arrive and it would likely be outdated because the object moved further in the meantime, even if it was resent reliably). There is also the get_rpc_sender_id function in SceneTree , which can be used to check which peer (or peer ID) sent an RPC. Let’s get back to the lobby. Imagine that each player that connects to the server will tell everyone about it. # Typical lobby implementation; imagine this being in /root/lobby. pass # Will go unused; not useful here. player_info.erase(id) # Erase player from info. # Only called on clients, not server. Send my ID and info to all the other peers. pass # Server kicked us; show error and abort. pass # Could not even connect to server; abort. # If I'm the server, let the new guy know about existing players. This keyword has two main uses. The first is to let Godot know that this function can be called from RPC. If no keywords are added, Godot will block any attempts to call functions for security. This makes security work a lot easier (so a client can’t call a function to delete a file on another client’s system). The remote keyword means that the rpc() call will go via network and execute remotely. The remotesync keyword means that the rpc() call will go via network and execute remotely, but will also execute locally (do a normal function call). The others will be explained further down. Note that you could also use the get_rpc_sender_id function on SceneTree to check which peer actually made the RPC call to register_player . With this, lobby management should be more or less explained. Once you have your game going, you will most likely want to add some extra security to make sure clients don’t do anything funny (just validate the info they send from time to time, or before game start). For the sake of simplicity and because each game will share different information, this is not shown here. Once enough players have gathered in the lobby, the server should probably start the game. This is nothing special in itself, but we’ll explain a few nice tricks that can be done at this point to make your life much easier. In most games, each player will likely have its own scene. Remember that this is a multiplayer game, so in every peer you need to instance one scene for each player connected to it. For a 4 player game, each peer needs to instance 4 player nodes. So, how to name such nodes? In Godot, nodes need to have a unique name. It must also be relatively easy for a player to tell which node represents each player ID. # Tell server (remember, server is always ID=1) that this peer is done pre-configuring. Depending on when you execute pre_configure_game(), you may need to change any calls to add_child() to be deferred via call_deferred(), as the SceneTree is locked while the scene is being created (e.g. when _ready() is being called). In most games, the goal of multiplayer networking is that the game runs synchronized on all the peers playing it. Besides supplying an RPC and remote member variable set implementation, Godot adds the concept of network masters. The network master of a node is the peer that has the ultimate authority over it. When not explicitly set, the network master is inherited from the parent node, which if not changed, is always going to be the server (ID 1). Thus the server has authority over all nodes by default. The network master can be set with the function Node.set_network_master(id, recursive) (recursive is true by default and means the network master is recursively set on all child nodes of the node as well). Checking that a specific node instance on a peer is the network master for this node for all connected peers is done by calling Node.is_network_master(). This will return true when executed on the server and false on all client peers. my_player.set_network_master(selfPeerID) # The player belongs to this peer; it has the authority. player.set_network_master(p) # Each other connected peer has authority over their own player. Each time this piece of code is executed on each peer, the peer makes itself master on the node it controls, and all other nodes remain as puppets with the server being their network master. stun() # Stun myself, could have used remotesync keyword too. In the above example, a bomb explodes somewhere (likely managed by whoever is master). The bomb knows the bodies in the area, so it checks them and checks that they contain an exploded function. If they do, the bomb calls exploded on it. However, the exploded method in the player has a master keyword. This means that only the player who is master for that instance will actually get the function. This instance, then, calls the stun method in the same instances of that same player (but in different peers), and only those which are set as puppet, making the player look stunned in all the peers (as well as the current, master one). Note that you could also send the stun() message only to a specific player by using rpc_id(<id>, “exploded”, bomb_owner). This may not make much sense for an area-of-effect case like the bomb, but in other cases, like single target damage.